Specifications and photos of unannounced Nokia C6-01 were leaked on the Dutch Nokia website. The Nokia C6-01 is considered to be an upgrade for the existing Nokia C6 touch screen phone, which is already available in a selected number of countries. The 3.2 inch sized Nokia C6-00 is a 5MP camera phone with QWERTY keypad. The design elements in Nokia C6-00 and Nokia C6-01 are almost the same, but the later has an 8MP camera with dual LED flash. Nokia C6-01 also has a slight change in the back panel design. 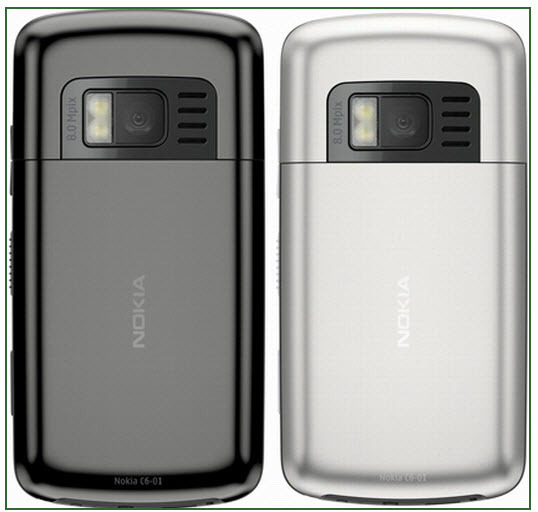 The Symbian S60 V5 powered Nokia C6-01 is the second Nokia phone with an 8MP camera, after N86. A 3.2 inch resistive touch screen display with 640 x 360 pixels resolution and 16 million color support. Nokia Symbian S60 V5 operating system. Home screen with customizable widgets, favorite contacts, live updates from social networking websites, email and SMS. 8MP camera with autofocus, dual LED flash. Quad-band GSM, high speed 3G. WLAN, A-GPS, Bluetooth with A2DP, music player, web browser, Flash Lite v3.1, up-to 16Gb expandable memory, Document reader and stereo FM. It seems that the Nokia C6-01 will follow the path of the original C6, and would get positioned in the mass-market segment. The expected price of Nokia C6-01 in India is around 16000 INR. We will keep you posted when we get more information about this device. could your’ll pls. give me an e mail I.D. so I could get in touch for my info. i dont think c6-01 have a qwerty key pad. remaining factors may be true. anyone have any ideas about c6-06 launching date in india? When does nokia c6-01 will be launch in the Philippines? I am planning to buy this phone. Can someone tell me how much it will cost?